As of writing this article it is quite tough to play Ingress here in Mauritius. Unfortunately, it seems that there is only a low awareness of this great Android app by Niantic Labs. is not what it seems." 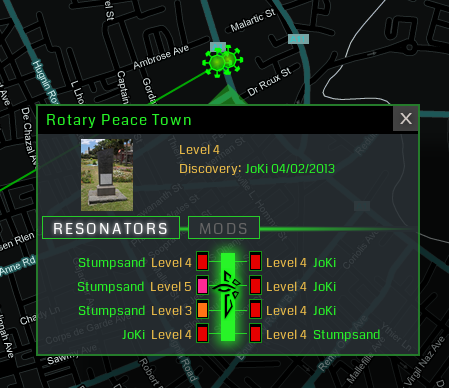 Using the Ingress scanner app opens your view of your environment to a completely new world of discovery, excitement and you get drawn into an epic battle between the factions in Ingress, namely Enlightenment and Resistance. Niantic Labs is an off-spring from Google and develops Ingress independently from the Big Brother of internet searches and activities. to get latest information about new technology, latest features for your scanner app, and of course to watch the battle reports of other players world-wide. It's great fun and very interesting indeed! First, request an invite on the Ingress website and get yourself an activation code for your future agent career in the Ingress reality. Unfortunately, this will take some time, frankly speaking a fortnight if you're lucky. I used this method to retrieve my invites twice and it took roughly 11 days until I received mail from P.A. Chapeau. Yes, there are at least two players of Ingress in our household... and maybe two more in the future. An alternative way would be submit any kind of Ingress-related artwork to the Google+ page, and see whether one member of Niantic Labs is getting in touch with you privately. This might eventually shorten the waiting period by going the extra-mile but due to lack of experience I can't comment on this. Simply checkout the existing artwork and follow the responsible people on G+. At the time, I started to play Ingress, there were approximately 8-9 portals in Port Louis only and collecting Exotic Matter (XM) was quite a challenge. I would assume that those portals were just the initial batch of locations Niantic pinned onto the map. Currently, the highest density of portals is obviously in Port Louis. The easiest way is to start at the Caudan Waterfront and walk to Jardin de la Compagnie and round up your tour at the Cathedral. But thanks to the possibility to submit new portals the numbers are increasing and it is actually fun to discover and report places for the game play. As a new agent you are starting on experience Level 1, and one of the aims you should follow is to gain more Action Points (AP) and level up quickly. Not only do get access to higher energy-loaded resonators but also acquire more powerful XMP bursters to cause quite some damage to the opposite faction. Furthermore, having the ability to link portals between each other based on the possession of their related portal keys, it is essential to maintain high level portals as their link range is higher. This allows cross-country connections and builds the base for huge control fields (CF) in order to gain Mind Units (MU). Control fields are created by forming a triangle of links between three portals. But be aware that portals, having 8 resonators, can only cater for a maximum of 8 links after all. Of course, no one can stop you from running around as a lone-some cowboy capturing and energizing portals. But unfortunately there is a slight catch. Higher levels can only be achieved by team-work. There are clear restrictions on the number of resonators a single player is allowed to place/upgrade on a portal. So, there is no chance to raise a portal to Level 8 on your own! Which is fantastic to my opinion and urges for communities and organised Ingress runs. The reports from other parts of the world have been amazing so far, and I would love to experience something similar in Mauritius, too. Luckily, I had a chance to play with agent Stumpsand - an Australian fellow on vacation, and due to his Level 5 status I quickly got new gear and was able to gain a lot of APs in a shorter time than before his presence. With his energized Level 4 portals at Grand Bassin and Rose Hill and my portal keys to almost any other portal on the island it was absolutely easy to create my first bigger CFs (see image above). Yes, you make an impact on the game! Simply by either submitting new portals to Niantic Labs to be reviewed and added to the augmented reality map in the future or by reviewing and improving existing portals. Both is possible through the Ingress Scanner app. As of writing this article, I think that I have submitted already more than 20 new portals of which 10+ are already on the map, and I suggested minor improvements to existing ones, like ie. the position of the MCB HQ at St. Jean which is currently not accessible from the public area. And I doubt that MCB would be happy to have masses of Ingress players on their gated property. It looks bright! And I'm hoping that this article gives you a brief overview and attracts more Mauritian players to join Ingress - either the Enlightenment or the Resistance for the sake of good game play! Are you already an agent? What do you think of Ingress? For sure this isn't going to be the last article on Ingress in Mauritius. Stay tuned! "Just a quick comment. You don't necessarily have to have a smartphone to play in Mauritius. A number of the portals I have visited have free Wifi within range so you could play with a tablet." Some days ago, and also notified in Google+ by agent Stumpsand, I came across a great article by Tim Bray on Advanced Ingress techniques. Also have a look at the other resources in his series: Ingress, Things About Ingress, Ingress, Month 3, Ingress Weekly, and Ingress Tourism.